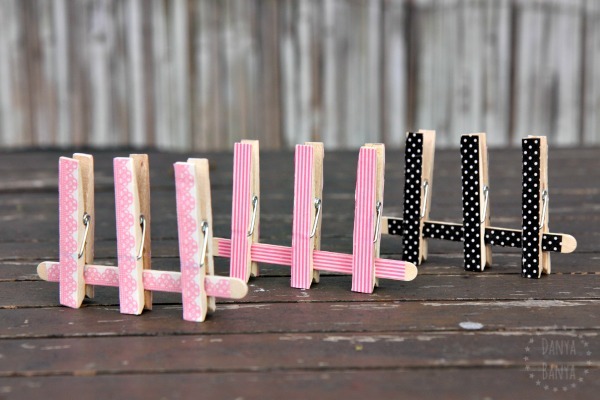 Easy DIY washi tape pegs (clothespins) game for toddlers and preschoolers. 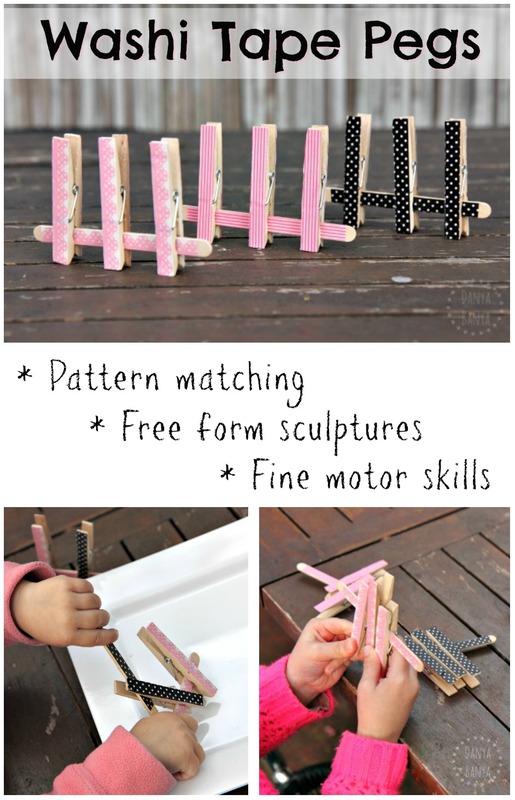 Fun for pattern matching, fine motor skills or creating awesome free form sculptures! Super quick one for today, as I’m desperately trying to get on top of my drafts folder, and I discovered this cute little activity from years and years ago. 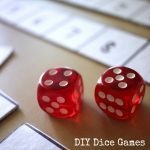 Can’t believe I hadn’t published it until now! 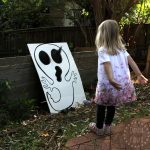 Anyway, this is a cute little DIY activity that you can make ahead of time, and have sitting on a shelf waiting for the kids to ‘discover’ it. 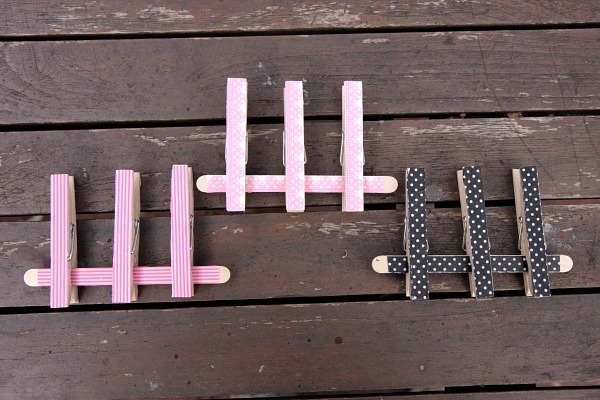 Stick decorative tape to both sides of 3 pegs and 1 craft stick. Trim as needed. Repeat with various patterns of decorative tape, until you have several sets. 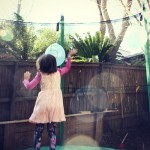 Leave jumbled in a basket where the kids will ‘discover’ it! 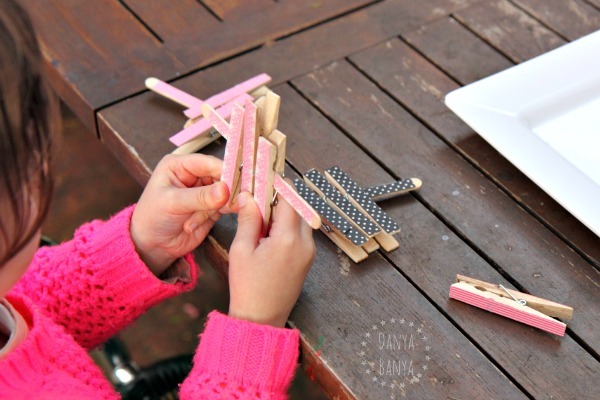 Miss Bee (who was about 2 years old at the time) used the decorative pegs and craft sticks to make a cool 3D sculpture! 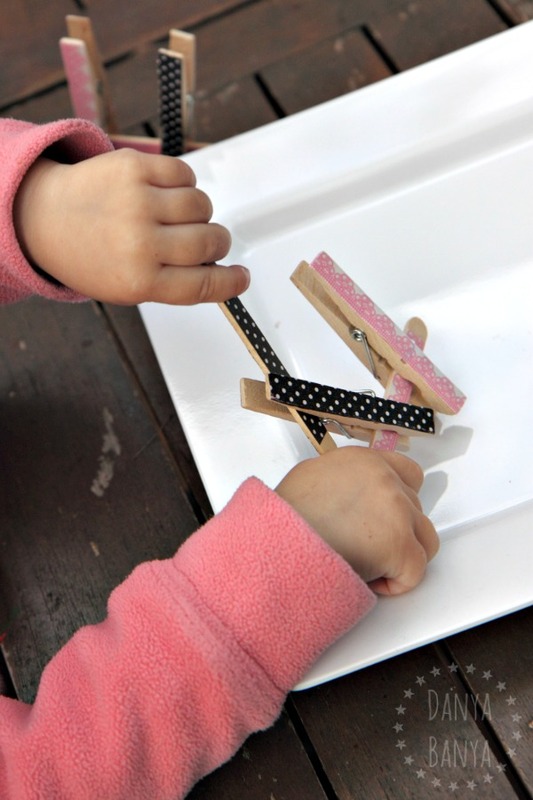 All that peg squeezing is also great exercise for her fine motor muscle development in her fingers and hands. Miss JJ (who was about about 4 years old at the time), played with it very differently. 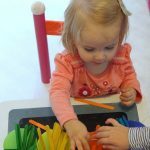 She noticed the different patterns, and preferred to put them together to make matching pattern sets. 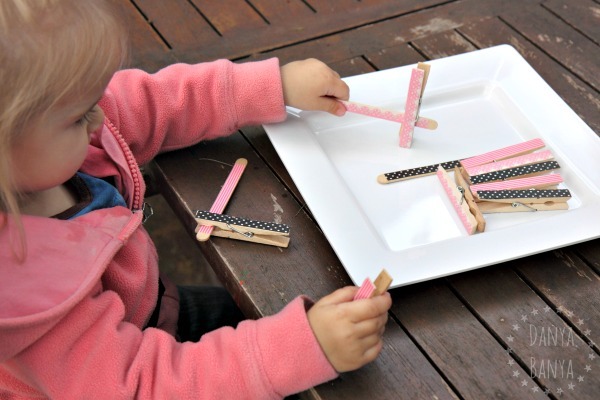 Over the years, the kids have also used their decorative pegs in all sorts of different ways. Sometimes they’re used to hang up their artwork. Sometimes they’re used to peg on price signs in their pretend store. Sometimes they’re used to tie on fabric as pretend robes or mermaids tails. They’ve become very special toys! 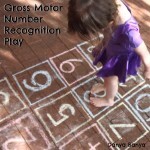 For more fun ideas, check out our Toddler Activities and Preschooler Activities pages. Or subscribe to our newsletter to receive fun ideas like this in your Inbox!